From the moment of Christopher Columbus' discovery of lands previously unknown to Europe in 1492, the New World captured the imagination of European adventurers. Thousands of men came to the New World to seek fortune, glory, and land. For two centuries, these men explored the New World, conquering any native people they came across in the name of the King of Spain (and the hope of gold). They came to be known as the Conquistadors. Who were these men? The word conquistador comes from Spanish and means "he who conquers." The conquistadors were those men who took up arms to conquer, subjugate and convert native populations in the New World. Conquistadors came from all over Europe: some were German, Greek, Flemish, etc., but most of them came from Spain, particularly southern and southwestern Spain. The conquistadors typically came from families ranging from the poor to the lower nobility: the very high-born rarely needed to set off in search of adventure. They had to have some money to purchase the tools of their trade, such as weapons, armor, and horses. Many of them were veteran professional soldiers who had fought for Spain in other wars, such as the reconquest of the Moors (1482-1492) or the "Italian Wars" (1494-1559). Pedro de Alvarado was a typical example. He was from the province of Extremadura in southwestern Spain and was the younger son of a minor noble family. He could not expect any inheritance, but his family had enough money to purchase good weapons and armor for him. He came to the New World in 1510 specifically to seek his fortune as a conquistador. Although most of the conquistadors were professional soldiers, they weren't necessarily well-organized. They were not a standing army in the sense that we think of it; in the New World at least they were more like mercenaries. They were free to join any expedition they wanted to and could theoretically leave at any time, although they tended to see things through. They were organized by units: footmen, harquebusiers, cavalry, etc. served under trusted captains who were responsible to the expedition leader. Expeditions, such as Pizarro's Inca campaign or the countless searches for the city of El Dorado, were expensive and privately financed (although the King still expected his 20% cut of any valuables discovered). Sometimes the conquistadors themselves chipped in funds for an expedition in the hopes that it would discover great wealth. Investors were also involved: wealthy men who would provision and equip an expedition expecting a share of the spoils if it discovered and looted a rich native kingdom. There was some bureaucracy involved, too: a group of conquistadors could not just pick up their swords and head off into the jungle. They had to secure official written and signed permission from certain colonial officials first. Armor and weapons were crucially important for a conquistador. Footmen had heavy armor and swords made of fine Toledo steel if they could afford them. Crossbowmen had their crossbows, tricky weapons which they had to keep in good working order. The most common firearm at the time was the harquebus, a heavy, slow-to-load rifle; most expeditions had at least a few harquebusiers along. In Mexico, most conquistadors eventually abandoned their heavy armor in favor of the lighter, padded protection the Mexicans used. Horsemen used lances and swords. Larger campaigns might have some artillerymen and cannons along, as well as shot and powder. Some conquistadors claimed that they were attacking the New World natives to spread Christianity and save the natives from damnation. Many of the conquistadors were, indeed, religious men, but make no mistake: the conquistadors were far more interested in gold and loot. The Aztecs and Inca Empires were rich in gold, silver, precious stones and other things the Spanish found less valuable, like brilliant clothes made of bird feathers. Conquistadors who participated in any successful campaign were given shares based on many factors. The king and the expedition leader (like Hernan Cortes) each received 20% of all loot. After that, it was divided up among the men. Officers and horsemen got a larger cut than foot soldiers, as did crossbowmen, harquebusiers, and artillerymen. After the King, officers and other soldiers had all gotten their cut, there was often not much left for the common soldiers. One prize which could be used to buy off conquistadors was the gift of an encomienda. An encomienda was land given to a conquistador, usually with natives already living there. The word encomienda cones from a Spanish verb meaning "to entrust." In theory, the conquistador or colonial official receiving an encomienda had the duty of providing protection and religious instruction to the natives on his land. In return, the natives would work in mines, produce food or trade goods, etc. In practice, it was little more than slavery. The historical record abounds in examples of conquistadors murdering and tormenting native populations, and these horrors are far too numerous to list here. Defender of the Indies Fray Bartolomé de las Casas listed many of them in his Brief Account of the Devastation of the Indies. The native populations of many Caribbean islands, such as Cuba, Hispaniola, and Puerto Rico, were essentially wiped out by a combination of conquistador abuses and European diseases. During the conquest of Mexico, Cortes ordered a massacre of Cholulan noblemen: only months later, Cortes' lieutenant Pedro De Alvarado would do the same thing in Tenochtitlan. There are countless accounts of Spaniards torturing and murdering natives to get them to lead them to gold. One common technique was to burn the soles of someone's feet to get them to talk: one example was Emperor Cuauhtémoc of the Mexica, whose feet were burned by the Spanish to make him tell them where they could find more gold. At the time of the conquest, Spanish soldiers were among the finest in the world. Spanish veterans from dozens of Europeans battlefields flocked to the New World, bringing their weapons, experience, and tactics with them. Their deadly combination of greed, religious zeal, ruthlessness, and superior weaponry proved too much for native armies to handle, especially when combined with lethal European diseases such as smallpox which decimated native ranks. Conquistadors left their marks culturally as well. They destroyed temples, melted down golden works of art and burned native books and codices. Defeated natives were usually enslaved via the encomienda system, which persisted long enough to leave a cultural imprint on Mexico and Peru. 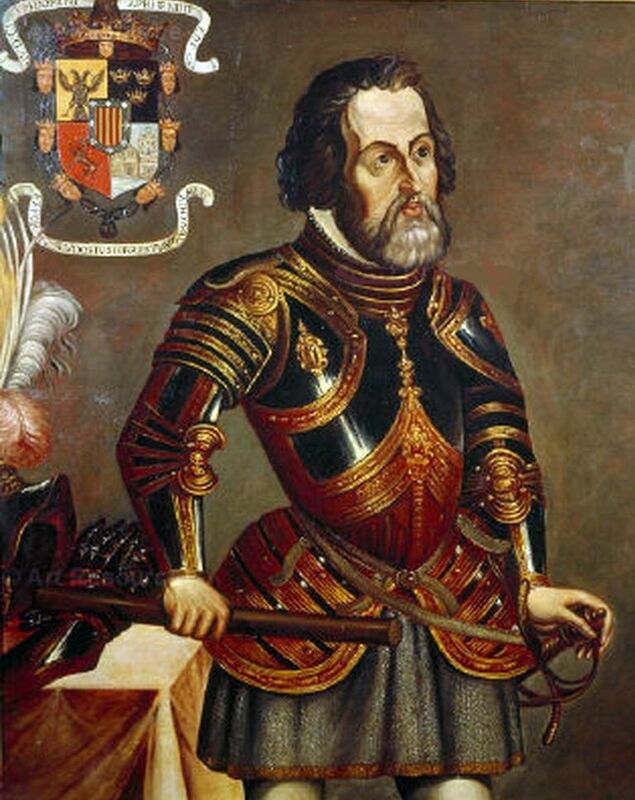 The gold the conquistadors sent back to Spain began a Golden Age of imperial expansion, art, architecture, and culture. Diaz del Castillo, Bernal. Trans., ed. J.M. Cohen. 1576. London, Penguin Books, 1963. Print. Hassig, Ross. Aztec Warfare: Imperial Expansion and Political Control. Norman and London: University of Oklahoma Press, 1988.
. New York: Bantam, 2008. Thomas, Hugh. New York: Touchstone, 1993.